Choose the decal colour of your VIAL evo Race! Choose the bar and the bar width of your VIAL evo Race! Choose the stem and stem length of your VIAL evo Race! Choose the crank length and chain ring ratio of your VIAL evo Race! Pick the saddle of your VIAL evo Race! Pick the seatpost of your VIAL evo Race! Award-winning genes for race victories! By the use of state-of-the-art manufacturing processes and materials our finest carbon components come to life by means of elaborate handcraft at our production site in Germany, which are characterized by outstanding technology and functionality. Direct sales allow as to be as close as possible to our customers as well as to offer competitive prices albeit the absolute high-end technology. This also includes the VIAL evo Race! 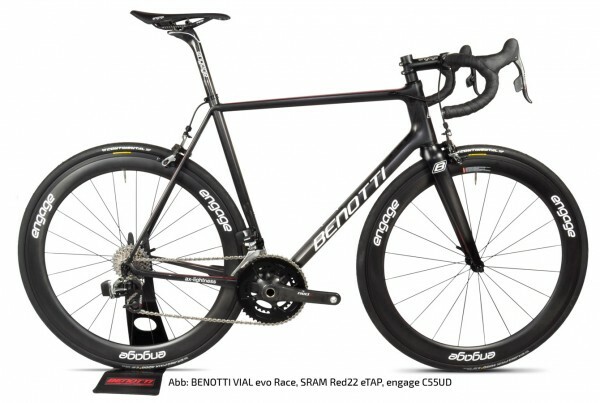 A racing bike of superlatives, which excels both through superior technical properties as well as through its very balanced riding characteristics. The VIAL evo Race shines through its extreme stiffnesses both laterally as well as in the bottom bracket yet offers an excellent comfort. The tremendous light weight paired with extreme resistance instantly transforms every stomp on the pedal in pure drive! The frame not only cover all ISO and overload test with flying colors, but also our much higher internal testing standards. For this reason the frame is also approved for a rider weight of up to 120 kg. The VIAL evo Race is infective and addictive! Customer evaluation for "VIAL evo Race, Ultegra Di2 R8050"